It’s only six thirty in the evening and already night has fallen in London. It’s winter, and at just five degrees the cold chills to the bone. She may hail from a tropical land but Aleida Guevara, daughter of the legendary Argentinian revolutionary Ernesto “Che”Guevara, doesn’t let the cold put her off. With a kind face and determined nature, you can easily picture her surrounded by children in her paediatric practice in Havana, but can just as easily imagine her on a podium, chanting a revolutionary slogan: “Hasta la victoria siempre!” (Until victory, forever!). As she speaks, her pride in belonging to the Cuban nation shines through. She predicts, without a shadow of doubt, the continuity of the communist regime in Cuba beyond the Castro dynasty. Nor does she doubt the suitability of the island’s economic system. Only one obstacle stands in the country’s way: the US blockade. A staunch supporter of the Bolivarian Revolution, she sees the heavy criticism poured on Nicolás Maduro as unjustified, his only sin being to have succeeded the all-powerful and charismatic Hugo Chávez. Just as her father was, Guevara is a passionate advocate of revolution. But she doesn’t see revolution as something that can be exported: the people must want it, and the people themselves must take it forward. Visiting a country which was once the largest empire in history, Aleida sees the attitude of western countries towards immigration as both hypocritical and absurd. She has nothing but admiration for different cultures and countries across the world, and thinks that what we need far more than globalisation is, as nations, to learn to understand and respect one another. 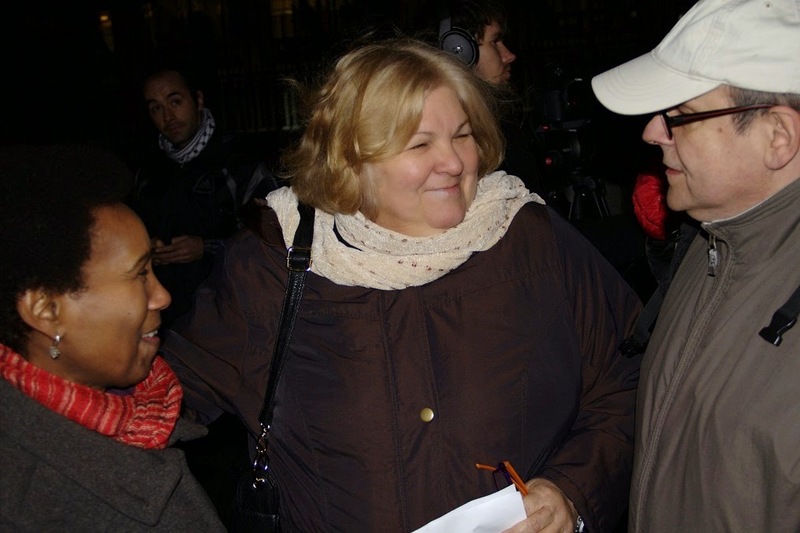 Aleida Guevara was in London as a guest of the Cuba Solidarity Campaign, and attended the annual vigil held in London in support of the Miami Five, three of whom are still in prisons in the US. Here she speaks exclusively to The Prisma. Yes, we’re hopeful. In the last few days something historic has happened: several US publications have spoken out in favour of Cuba. Some of them have mentioned The Five case and the possibility of an exchange for prisoners we have in Cuba, something we are of course prepared to do. We can only hope the US agrees. Obama has yet to close Guantánamo and it seems unlikely that he’ll lift the blockade. Could this change in the near future? This is more problematic. From the start Obama has always said he would close the prison, and our response to him was: “It’s not only a question of closing the prison, president, it’s a question of giving us back our land. For over a hundred years nothing has been signed. According to international law, the treaty died a natural death: in effect you have seized our land”. Even that didn’t get his attention. They are the most powerful nation on the planet and they just don’t listen to other countries. Do you think the formation of a United Latin American States is possible? It’s not only possible, it’s essential. It’s the only way we can face up to the common enemy of all our countries: The USA. Can the revolution and the Latin American movement survive beyond its leaders (Correa, Evo, Hugo, Lula…) or is it too bound up in them? At least in Cuba, there’s no doubt. The level of cultural awareness amongst the Cuban people is extraordinary: the people know what they want. There will of course always be difficulties, but we are capable of getting over them. We can analyse situations, discuss them in depth and come to our own logical conclusions. At the moment the people of many Latin American nations still don’t have a strong level of cultural awareness. In other words, they have their ancient cultures, they have that knowledge, but when it comes to being manipulated they’re easy to deceive, and they’re used as easy targets. Put simply, they’ve been tricked so many times over the years that it’s hard for them to react against something they’re accustomed to. It’s a difficult situation. Take Bolivia for example: twenty years ago statistically Bolivia was one of the poorest countries in the world, and today it’s a totally different country, with its own wealth. It’s its own master! And consequently it can do amazing things for its people. And once you’ve had a taste of that, who can take it away from you? Why are they snatching it away from you? It’s difficult, it really is. Do you think the Bolivarian Revolution will continue or decline under Maduro? The problem with Maduro is that the whole world tries to compare him with Chávez. It’s no good, none of us is the same. Maduro is his own type of leader, it’s a similar scenario to Raúl and Fidel: the leaders share the same ideologies, they have the same principles, but different personalities – they’re different people. We can’t aspire to all people being the same, clones of one another. The great thing is that different men can do the same for their countries. Maduro has a huge number of ways in which he can help his people, he’s shown that in recent years. He just needs support, and to continue the work he’s doing. Who have been the losers of the Bolivarian Revolution? Have people had to sacrifice their rights in the process? In any revolutionary process sacrifices need to be made. I once interviewed Chávez and asked him just that: whether the revolutionary process had damaged a lot of people’s economic interests. He told me that in reality, no: the problem is that certain people don’t want to give up anything, even the small things. And precisely because they reacted so badly, the revolutionary process had to get more and more radical. But it was because of them, they are the people who provoke such situations: in Venezuela there are plenty of economic opportunities for everyone to live well. What happens is that people have to share, they have to show respect for the poorest people and give them the opportunities they need. And that is simply not what they want to do. Could the Bolivarian Revolution be exported to countries outside of Latin America? Revolutions are not negotiable. Revolutions must surge from the hearts of the people: they’re not something you can export. What future awaits Cuba after Raúl Castro? Will the Communist Party stay in power? Yes of course! The Communist Party in Cuba isn’t in power, the Cuban Communist Party is the only party in Cuba and power is in the hands of the people. The people trust the party – they choose us. They are the ones who decide whether we have the requirements needed to be in the party, or whether we don’t. It’s not a question of you wanting to be a member of the party, it’s the people who say: “Yes, they’re leading the way: that’s why they’re in the party”. Would the people of Cuba want radical economic change? No, never… never. We want to see an end to end the blockade, we need it. If the blockade was lifted there would be an immediate change in Cuba’s economic fortunes: it would blossom overnight. The problem is that for as long as the blockade stays in place we’re constantly having to find alternatives and work out ways to confront the issues we face. We may be wrong about certain things, it’s a human process. But what’s important is correcting your mistakes in good time. What do you think about anti-immigration policies in Europe and globally, particularly here in the UK? I think they’re absurd. Firstly, because unfortunately these very countries colonised millions and millions of people across the world. They planted the dream of a different world in the minds of so many people, selling an image of a land different to their own. So it’s only logical that people from other countries have migrated: they’re in search of a better life.Restrictive laws won’t stop immigration. Only projects geared towards economic and social development in the countries the migrants come from will help these people. Would you say we live in a globalised world, without borders, but it’s only for capitalists? The ‘globalised’ world is doing so much damage in so many ways. It is as though our identities are being erased and it’s awful. People need to know who they are themselves before they can know and understand others: first you need to know who you are. In that sense, trying to scrub other cultures off the face of the earth is so damaging, because we all have something to learn from cultures different to our own. There are so many interesting things to learn from indigenous cultures, Arab cultures, Chinese cultures. Why can’t we? Perhaps it wouldn’t suit everyone, of course, and yes, we all have our own culture, but we could learn so much and adapt things to our reality and see how we can improve our own lives. Put simply, it’s about respect. What we need more than globalisation is to learn how to respect one another. Do you think a lack of economic interventionism was one of the causes of the recent economic crash? No, I think it was capitalism itself. It’s the very nature of capitalism: the gap between the haves and the have-nots just gets bigger and bigger. After more than two hundred years of capitalism 80% of the world’s population are still in need. It hasn’t even solved the most basic of our human needs: it doesn’t work, and we must find an alternative solution.